A reliable source for HEPA Vacuum Cleaners information and a resource for accessing leading HEPA Vacuum Cleaners and suppliers. 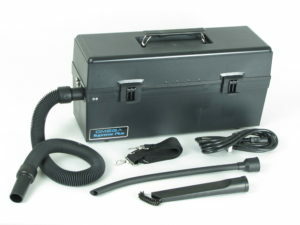 High-Efficiency Particulate Air vacuums, or HEPA vacuums, are industrial vacuum cleaners that feature HEPA filters. In order to qualify as a HEPA filter, a filter must be able to capture 99.97% of all particles 0.3 mm (micrometers or microns) in size or larger from the air that passes through it. Applications like radioactive dust removal from plant exhaust, clean room sterilization and many other uses that require strictly controlled air pollutant levels make use of HEPA filter vacuums. HEPA Vacuum Cleaners High Efficiency Particulate Air vacuums, or HEPA vacuums, are industrial vacuum cleaners that feature HEPA filters. In order to qualify as a HEPA filter, a filter must be able to capture 99.97% of all particles 0.3 mm (micrometers or microns) in size or larger from the air that passes through it. Industries that benefit from HEPA vacuums include electronic parts fabrication, health care equipment production, pharmaceutical products development, chemical research and petroleum products development. The highly efficient filtering capabilities of HEPA vacuums are what differentiate them from other vacuum cleaners. HEPA Vacuum Cleaners - Atrix International, Inc.
HEPA vacuum cleaners are especially useful for the removal of contamination, mold, or dust from air. Different filter models may filter wet material, dry material or both. Many industries require the use of enclosures that have been cleansed of airborne contaminants. Clean rooms, for example, need to be allergen-free and often make use of HEPA filters for air filtration. These clean rooms are intended to be containment-free environments, which are used for the production of items such as microprocessors and other small technological components. Many industrial vacuums feature filters that may resemble HEPA filters but do not actually qualify as HEPA filters. They are typically filters or paper bags of similar construction or fibers to those used in true HEPA filters; they may even be nearly indistinguishable from HEPA filters. In some building maintenance contexts, HEPA filters are not necessary. Light janitorial or home vacuuming applications, for example, are not required, except in certain circumstances, to contribute to air quality improvement. In these circumstances, a regular filter bag or other filter system can be appropriate. But as the HEPA filter technology designs are reduced in cost and become more accessible, more and more light janitorial applications are making use of vacuum systems with HEPA filters. The American Lung Association, though it does not endorse products, has become a “Health Partner” with certain HEPA filter vacuum cleaner manufacturing companies that market their products to schools; this speaks to the perceived importance of vacuum cleaners’ contribution to air quality. Some schools have responded by purchasing portable vacuums and central vacuum systems with HEPA filtering.